Loosely woven netted Dishcloth is great where scrubbing action is required in the kitchen. It’s also great for removing flour, dough or other sticky substances from benchtops after baking. It stops transferring germs without absorbing debris, odours or grease. It is made from 100% nylon. You can also use it to pick up things dry flour or coffee grounds, and then rinse easily under the tap. Where and how to use: Use anywhere scrubbing action is required. Easily removes stuck-on food from plates, bowls, pots, pans, hand-beaters, cheese graters, bench tops and inside microwaves. It goes to work on stubborn soap scum and cleans bugs off your car grill and windshield. I have even used it (dry) to pick up dry petals and leaves my children had left strewn over the carpet! Here’s a quick video I did the first time I tried it. You can see I had a bit more to go before I’d have it clean, but I was pretty impressed, and have used it this way again since. 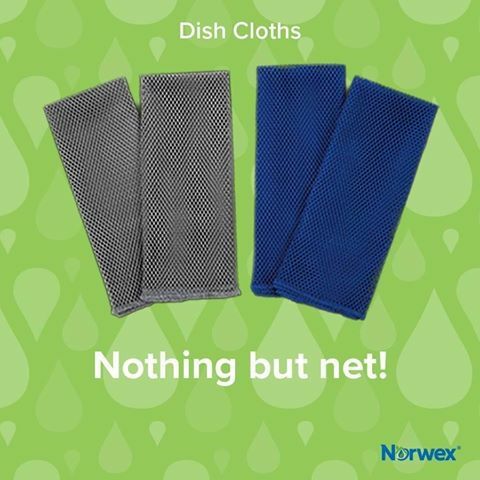 You can buy the Norwex Dishcloth online from me, in Australia. Or you can buy it in New Zealand here (from Louise Swart). If you are elsewhere, check Norwex.com to find a consultant in your country. Of course, if you already have a Norwex consultant, you can contact them directly to order.